High Nelly Cottage is a delightful, character cottage set 8.5 miles from Abbeyleix in County Laois. With two mezzanine bedrooms set in the apex of the roof, with sloping ceilings, the property can sleep four people. Downstairs is a homely open plan living area with kitchen, dining area and sitting area with electric range, along with a utility room and a shower room. Outside is a lawned garden with furniture, plus two off road parking spaces to the rear of the property. High Nelly Cottage sits in a superb touring location and provides couples and small families with a charming, character base for discovering much that Ireland can offer. For an enticing mix of old and new, County Laois is ideal, with castles and art galleries attracting visitors whilst the tranquil pastureland, forest trails and mountainous scenery of the county make the perfect escape. Electric radiators with electric stove. 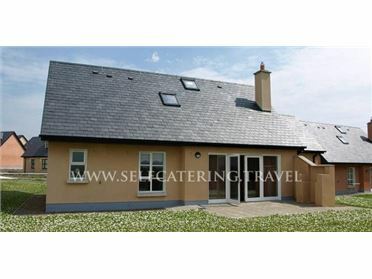 Multi-fuel range, electric oven and hob, microwave, fridge/freezer, washing machine, TV with Saorview, WiFi. Fuel, power and starter pack for range inc. in rent. Bed linen and towels inc. in rent. Off road parking for 2 cars. Lawned garden with furniture. Two well-behaved pets welcome. Sorry, no smoking. Shop 4.5 miles, pub 2 mins walk. Note: Sloping ceilings in bedrooms with limited headroom. .